Click the links below the pictures to get the downloads. News Today 4 14 08 - Wardrobe Wrangler Update, New Stuff From macgirlffx! Hello again! Quite a few new things today! First off, I've finally updated the Wardrobe Wrangler. The new 1.1 release contains MANY new features and bug fixes. There are far too many to list here, so read about it on the Sims 2 Programs page. Now for all the shiny new stuff macgirlffx has for us! First off, she has remade some of the University tops so that they no longer have the painted on jewelry and can be used with other custom content accessories instead. You can grab them on the Clothing page. Second, she brings us two new makeup sets. The first is a set of new subtle blushes available for teens through elders. The second is a set of 12 different lipstick colors. You can get both of these things on the Overlays page. And last, but not least, is a new community lot. Named Unity Pavilion and themed after the Far East items included in Bon Voyage, this lot is perfect for a Far East vacation hood or even your regular hood! Be sure to pick it up on the Community Lots page. That's all for now, look for more soon! Affiliates and Other Nifty Buttons! Take a Poke! News Today 3 03 08 - Free Time Hack Updates, New Hacks! Hello everyone! Today I have three hack updates and three new hacks all set and ready to go for you all! First, let's get to the updates. The following hacks have been updated: Vampire Biting Control, No Chance of Plant Sim, and Some Chance of Plant Sim. Note that even if you don't have Free Time, you should update the Plant Sim related hacks as I made some changes for them for the BV version as well. Grab the updates on the Global Hacks page. The remaining hacks that have yet to be updated can be found on this list. Now on to the new stuff. First off, I have two new Free Time related hacks. First off, if you've played the game at all, you've probably discovered that Rod Humble delivers a free computer to all your sims along with a copy of "The Sims 3". Other than the obvious plug, some people may simply not want this because it's unrealistic for Sims to get free computers from EA. So, this hack allows you to either choose whether or not you want the computer or to banish Rod Humble altogether. The day EA gives all us devoted Sims players free computers with the copy of the latest EA game is the day that I will remove this hack. The second hack is something for my own sanity, and maybe yours as well. It stops the sound and/or glow that happens to Sims who have a hobby maxed out and get "in the zone". This is particularly annoying when a sim is performing a repetitive task that's related to the hobby over and over again. And finally, the last hack is something new and shiny for your Sim teens! It adds additional scholarships for the various talent badges that a teen can earn. I've always felt it strange that EA didn't add this when the talent badges were introduced, so I've gone ahead and done it for them. You can grab all these hacks on the Global Hacks page. Enjoy, and look for more soon! All hacks have been checked for compatibility with Free Time, and I'll be updating soon. Please check HERE for the complete list of what needs updated. News Today 1 22 08 - New Program and New Residential Lot! We took a break last week but now we're back with another update! First off, big news for all the Mac Simmers out there, a new program is now available! 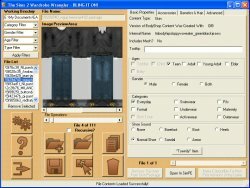 It's a Sims2Pack installer similar to Clean Installer (although it doesn't have nearly as many features) and it will allow you to install Sims2Packs selectively and get an idea of what's inside before you install it. You can find it on the Sims 2 Programs page. To accompany this, there is a new section on the forums devoted to all things Mac. Come on over to Apple Island and check it out! This week, Biscuit-The-Great brings us a new residential lot that will fit right into the suburbs of your Sim's hood, ready for them to move right in. 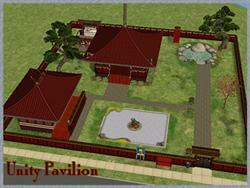 You can grab it on the Residential Lots page. That's all for now, but more exciting things are on the way, so look for them soon!